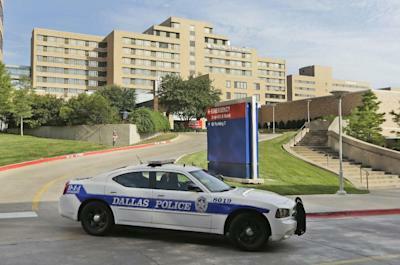 DALLAS — A Texas emergency room’s mishandling of the country’s first Ebola patient prompted the CDC to issue a nationwide alert to all hospitals updating them of how to appropriately respond to possible cases of the deadly disease. “It’s a teachable moment, as we say,” Dr. Thomas Frieden, director of the Centers for Disease Control and Prevention, said during a Thursday press conference. The latest guidance includes a poster with quick rules for evaluating returned travelers and a checklist. The move comes nearly a week after Thomas Eric Duncan showed up at Texas Health Presbyterian Hospital with what officials described as fever and abdominal pain. Duncan, who had just moved to Dallas from West Africa, reportedly told hospital workers that he was recently in Liberia, one of the hardest hit areas of the deadly Ebola crisis. Investigators in Texas are trying to track down some 100 people who might have been in recent contact with Duncan. A dozen of them are already under quarantine or being monitored for Ebola symptoms. Federal guidelines published in August advised someone in Duncan’s condition and who was known to be in West Africa to be placed in isolation and tested for Ebola. Instead, Duncan was given a prescription for antibiotics and sent home. Lakey said hospital administrators have promised health authorities answers. Duncan left the emergency room early last Friday and went to a nearby apartment where he had been living with several family members since arriving in Texas on Sept. 20. By Sunday, his condition had worsened and an ambulance was called to make the milelong trip back to Texas Health Presbyterian. He was immediately placed in strict isolation. As of Thursday morning, Duncan was in serious condition, according to hospital officials. A government agency with regulatory oversight over federally funded hospitals said Thursday it is also monitoring how the mishap with Presbyterian hospital plays out. The Centers for Medicare & Medicaid Services can investigate whether the hospital conducted an improper examination for infections and other illness under the Emergency Medical Treatment & Labor Act. Jason Sickles is a writer for Yahoo. Have a story tip? Email him at jsickles@yahoo-inc.com. Follow him on Twitter (@jasonsickles).